When we think of wearables, we often think of devices clinging to our bodies. Smartwatches and fitness trackers – sometimes even headgear or glasses – that are tracking our vitals with state-of-the-art sensors. Which new gadgets can enable what new data? How advanced and accurate are the sensors within them? The University of Southern California's Center for Body Computing believes that software is more important than hardware. Its executive director and founder, Dr Leslie Saxon, tells Wareable that – ultimately – most sensors in devices are going to become medical-grade. What'll separate devices is what powers them. 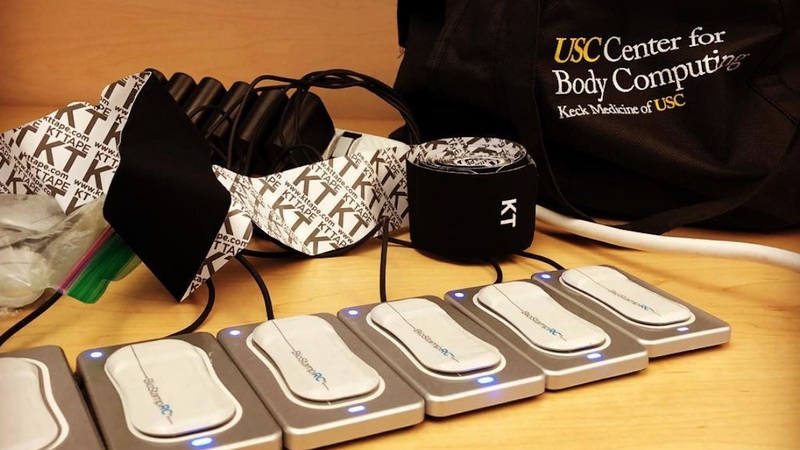 The crown jewel of the CBC is the Virtual Care Clinic, which not only pulls in students from departments around USC's campus, but a number of companies, like VSP and smart pill maker Proteus. It is constantly absorbing new technologies, from telemedicine to VR, and incorporating them into its central mission: the protected free flow of healthcare information around the world. We're working in cars, why can't we have a health car that delivers your drugs? The VCC is inspired by Saxon's own interests in connected medical devices. She realised the potential of medical devices always being connected to a network where doctors could have access to their patients and their symptoms and conditions. But as she also explains, medical conditions don't exactly show up on time. Diseases and symptoms don't spring up on a schedule, so to Saxon it doesn't fully make sense to build healthcare around a system where people make appointments. Instead, a connected digital healthcare system could let doctors know when patients need them, focusing their energy on those who need help and not the ones who don't. A good example of this is DocOn, a system built using the VCC. A person can video call a digital version of their doctor and ask questions. The AI powering the doctor, which was created with volumetric capture, can then help the person figure out whether they actually need to see their doctor in-person or whether it's a non-serious issue. So, wearables are only a portion of the larger future of connected healthcare. Wearables are pretty good at collecting our data right now, from our sleep stages to heart rate. Soon, detecting things like atrial fibrillation and sleep apnea through wearables will be a reality, which is great, but it's just one facet. Wearables can only do so much; they're instruments best used for measurements. Saxon argues that if your health data was easily transportable, it could be used by other services to get you the help you need without putting you at risk. It would be a true revolution in how the healthcare system operates. "We're working in cars, why can't we have a health car that delivers your drugs?" she says. "The most unhealthy thing for a super-elder person to do is stand in a pharmacy and not have their prescription ready and get exposed to everything else… It's aggravating, right? Why can't we start delivering services behind this technology that really meet people?" The consumer's really in control. They're the orchestra conductor. Not me, the cardiologist. This also includes using software to change the use of devices. For instance, Saxon says an implantable for a soldier could be changed depending on what their needs are. There could be different software suites activated depending on whether the solider is deployed, training or living civilian life. The seed of this idea comes from the driving mission of the CBC: the patient is the customer. "Every digital health solution we design, we try to remember that our mission is the patient, or the athlete or the war-fighter," Saxon says. "It's not anything else, so we try to meet our moral and ethical obligation to the individual to put them in control and not try to sell them out right away with a bad business model or inaccurate data or no bill of rights for them." Yes, a bill of rights. The CBC considers medical data as the "last real civil right", as people tend to have easier access to their other data, including important markers like financial data. That doesn't just include access to the data though, it also includes protection for that data. Saxon argues that customers need their health data, as well as the data of their loved ones, and need it in an easy-to-digest way that's always available. The CBC is able to straddle the worlds of healthcare and technology because it knows both. For technology companies, the CBC can help educate them on how to conduct safe studies, and how the healthcare industry works, including how how to get FDA approval – Saxon herself was involved with the FDA's policy on software. For health companies, the CBC helps understand the world of technology. It knows how to create software that's actually easy to use, and understands and experiments with the latest technological breakthroughs. The CBC also helps its partners create apps, devices and services so that companies don't flail around their arms and put out something half-baked. Those partners include Fitbit, AliveCor and VSP's Level, and its work includes the design and user engagement research for the Level smartglasses and exploring a phone case for AliveCor's ECG sensors. "In this new model of healthcare, the consumer's really in control. They're the orchestra conductor. Not me, the cardiologist who chooses this implantable defibrillator to implant in somebody vs. another company's. Because this costs $50,000 so this company who makes it sees maybe me as the customer, not the person I'm implanting it in, right?," Saxon says. "But in this new healthcare, the consumer's really the customer. I think companies like Apple and Amazon understand that pretty well. The question is how regulated and how deep into the pool do they want to get, or do they want to just put up the platform? Let other people build it out." If medical and health data can be used to give people better health services and treatment, and other people are building out the services, the obvious next question is how we secure that data. From Strava to MyFitnessPal to Facebook's Cambridge Analytica scandal, consumers seem to be finding out – the hard way – what happens when our data is abused. The CBC has been tasked by California's Governor's Office to lead a group of health IT workers in an effort to act as the guiding light on healthcare data and security. It's essentially an advisory board that helps companies consider potential pitfalls to the health data collection they may be garnering, and how they can best protect data. Saxon says government regulation may be key in this area, as no one wants a situation where a shady third-party sells data through a backchannel and then a company is blaming the patient for not updating their app on time. That, Saxon argues, isn't a mature approach. Instead, Saxon believes healthcare and health data might have to become a shared responsibility. It's going to have to be a part of a cultural shift that brings in everyone, from the regular person to the biggest companies to governments She likens this approach to water conservation, where there's government regulation to curb irresponsible companies, responsible companies, and a cultural awareness. Just like people seem to instinctively know that wasting water is bad, people should know that sharing your health data with third parties or not updating your software for security updates is bad. This is especially true when it comes to whether health data should be allowed to be sold. Saxon says one potential promise of connected health is that it can better serve poor people who need better healthcare, but she worries that if health data can be sold, and people have the right to sell their data, the desperation to alleviate poverty can lead to people selling their data into the wrong hands. Selling data doesn't just have to be for cash either, it could serve as a bridge to internet access or electricity. It's like how Facebook takes your data and uses it to sell your attention so that you have access to a large social network of people and brands. Or how Google takes your data in exchange for fast access to the world's information. How far are we until the future of sensor-packed smart pills? The problem is that the data could be sold to a party that intends to weaponise it for their own use, explains Saxon, who lists several scenarios. This could mean a sort of ransomware attack, so that hackers hold your healthcare data hostage just before a big surgery where doctors need your information. Or maybe a terrorist event where, in an effort to double the damage, people's blood types are changed electronically, affecting their treatment post-event. Or even just selling the data on the dark web. These scenarios are not farfetched. In the past year, we've seen companies slowly begin to transform from being solely device companies to being health companies. Fitbit has done this a lot. Apple, with its ResearchKit initiative and new Health Records feature, has also prepped itself for the future of deep health. The Center for Body Computing ultimately takes a broad view of connected health, looking at how every technology could be applied to helping people get the treatment they need. Once they do that, it's time to connect the dots. "And then who's best positioned to do that, right? You look at companies like Amazon, 'Oh wow. They've got Whole Foods. They could have pharmacy. They have this.' Who's in the best position to deliver that, and will they? And what partnerships do they need to do it? That's the kind of thing we're trying to motivate."